The Multi Cyclone is a filtration device that is capable of saving water and reducing filter maintenance. The Multi Cyclone works on the basis of centrifugal water filtration. There are no moving parts to wear and tear and no filter media to clean or replace. Incoming water is guided by a diverter plate so that it enters multiple hydro cyclones tangentially, generating a strong centrifugal effect. This spins the sediment out to the hydro cyclone's wall and then spirals it down to the sediment sump, while the cleansed water spirals upwards. 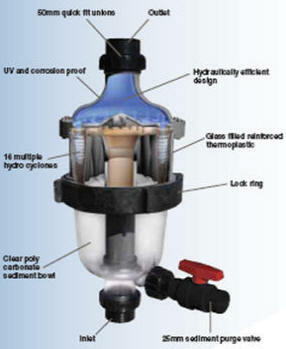 The accumulation of sediment can be visibly monitored through the Multi Cyclone's clear sediment pump. It is cleared by simply opening the purge valve. Only 15 litres of water is discharged to clean the unit of sediment. The Multi Cyclone is ideal as a pre-filter to extend the life of your existing filter. The filtration efficiency of the Multi Cyclone was tested by feeding 5 to 80 micron dust particles through the Multi Cyclone and analyzing the percentage of dust particles trapped in the sediment bowl. The laboratory test revealed that the Multi Cyclone was effective in filtering particles sized 40 to 80 microns. The unit works together with a sand, cartridge, bead or DE filter to polish the water. It allows the installation of finer filtration systems, such as cartridge filters with finer cartridges and the sand filters with finer filter media. The water ends up clearer with less up keep. The unit is supplied with both 2"/63mm quick connect unions making this unit ideal for new installations and retrofit market. Minimum flow is 3m3/h, max. flow is 30m3/h. Max. pressure is 4 bar. The Multi Cyclone must be installed after the pump.